It was with a profound sense of sadness that I learned of the passing of Russ Harris in January 2005. For those who might not be familiar with him, Russ was the head of the Jeff Gordon Fan Club from its inception in the late 80's until 2000. Working out of his office in Arizona, Russ and his wife Molly coordinated fan club events, answered fan questions, coordinated regional gatherings, and started a Jeff Gordon museum. When I started this website it wasn't long until I received an email from Russ. 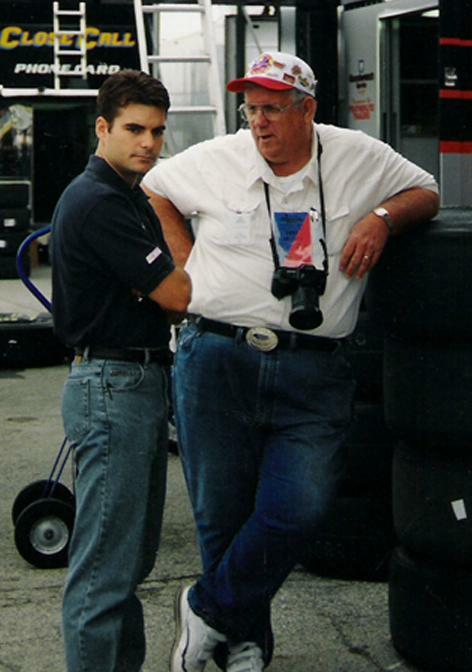 Over the years we corresponded and chatted about racing and also about life. He provided a sounding board on occasion and he provided me with a gift that I still marvel at to this day. Even after his association with Jeff Gordon ended, we stayed in touch about his new endeavors. He was going to retire with Molly to a quiet lake in the Ozarks. After all, there was bass fishing to do. But the lure of racing kept him around. He eventually signed on to run the Rusty Wallace Fan Club. Like everything else he did, he did it well. As much as we tried to cross-promote our work, it was often comical when we'd discuss how the two fan groups "just don't like each other." In the weeks following September 11, 2001, I had put the website on the back burner. There were some pressing issues in my life that I needed to attend to. I didn't know whether I'd write about racing until the following season. But in late September I received a call from Russ. He talked about his son in the military, and left me with the following line: "Help the community through this and put it back together." In essence he was saying that getting back to the things I enjoy can heal the community that I built. I know that he'd want me to get back to work. There's a new season on tap and he'd want the fans to be informed. That's what he was about-- putting the fans ahead of everything else. Putting people ahead of a dollar, and doing more for others than they would ever realize.